Does your kiddo have a mischievous streak? Do they have a passion for omelets and carrot juice? Wait, maybe they haven't tried carrot juice. Pause for a second. Go to the store or kitchen. Procure some carrot juice. Give said carrot juice to your child. Are they freaking out after downing the bright orange concoction? If so they might be a Rabbid. Hey! Don't worry, it's going to be okay. This kind of thing happens more than you think! These crazed bunnies are all over the place and they are masters of disguise. So, don't feel bad for failing to notice that your child is actually a cartoon bunny. It happens to the best of us! Just last week a supposed group of kindergarteners were uncovered as the uncouth Rabbids dressed in corduroy overalls and pigtail wigs. Their teachers were wondering why the vegetable option at the school lunch was suddenly such a hit, now they know. 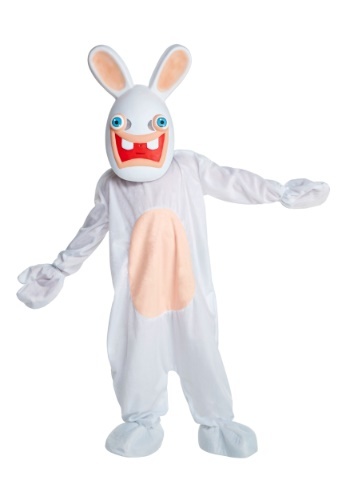 So, what do you do now that you know your kiddo is a Rabbid? Have fun with their new identity. Any slightly fun situation can be elevated. Planning a simple water balloon fight? If a Rabbid has its way you'll be shooting giant water balloons off the roof at passing cars with a homemade sling shot in a matter of minutes. Okay, actually that sounds like trouble. Maybe you should designate their Rabbidness to one night. That seems more manageable. This Halloween let your child's Rabbid flag fly with this deluxe costume! Your kiddo's zany side will flourish in this over-sized molded mask with its 3-D bugged out eyes, wide and slightly crazed smile, and disturbingly adorable ears. The one-piece white jumpsuit with a flesh toned belly and hand and feet covers is easy to put on, it simply secures with touch fasteners in back. Your child is going to have a great time in this ensemble but if you want to keep things under control stay away from carrot juice!